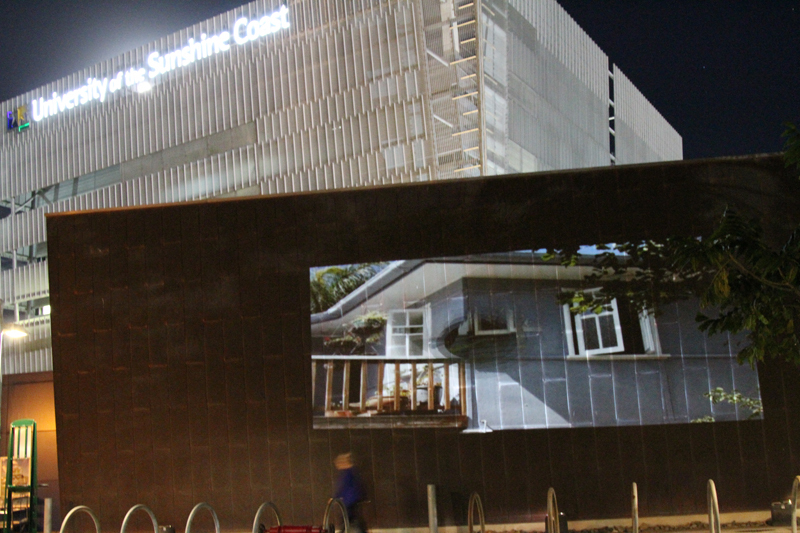 Fibro Coast opened at University of Sunshine Coast Art Gallery on Thursday June 12th and runs until August 16th. There’s an interesting mix of objects, photos, memorabilia, and historical and traditional artworks, which sounds like a very eclectic exhibition, and it is. However co-curator John Waldron and Dawn Oelrich from University of Sunshine Coast Art Gallery have done a wonderful job putting together this large and complex exhibition and it looks good. On opening night exhibiting artists Judy Barrass and Corrie Wright welcomed visitors to the gallery with a projection performance on the copper walls of the gallery that included imagery and drawings of fibro houses and furniture from the 50’s and 60’s. After a successful showing at Gold Coast Arts Centre Fibro Coast exhibition will open in a new format at University of Sunshine Coast Gallery on June 12th presenting material from local private and public collections, artworks, architectural drawings, contemporary and historic photographs, ephemera, objects, and oral histories documentaries. There is, in short, something for everyone. More information can be found on the Gallery website or at BlueSkyView. My work for Fibro Coast includes video and a series of small, evocative, paper structures reminiscent of reliquary boxes. In wandering around my neighbourhood of Noosa photographing fibro houses for the project I was very aware that we are fast losing this part of our heritage. Many of the houses I photographed were for sale, not as houses but as development sites. Sometimes all we have left is piecemeal, blurred images, small fragments of the past. I have collected some of these fragments and boxed them as precious objects might be housed in a reliquary box, a tiny shrine to the past. Collective Insites – Awards and more. The Collective Insites project has been over now for some time, but before I wrap it up on this blog I should congratulate everyone involved for achieving a GAMMA Award for one of the best projects in 2011. Read about the awards at http://www.magsq.com.au/01_cms/details.asp?ID=868. 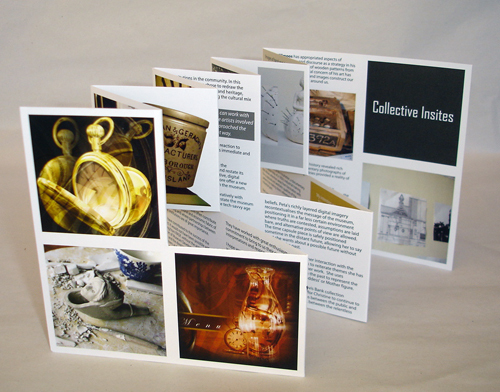 Collective Insites is also now featured as a case study on the Arts Queensland website at http://www.arts.qld.gov.au/docs/collective%20insites%20case%20study.pdf. There’s possibly more I’ll post about collective Insites. I have a lot more images I should sort out and post and hope I can get to do that soon. In the meantime I’m going to start using this blog to feature other works and projects that take a creative approach to history. An extended version of the catalogue essay with an introduction to the project and a section on the work of each of the artists is now available in e-book format at all major e-book retailers including the Kindle store on Amazon, Apple, Barnes and Noble, Sony, Kobo and Diesel. The book can be easily accessed in all e-reader formats as well as PDF and HTML by visiting the Smashwords publishing site at this link http://www.smashwords.com/books/view/60135 or through any of the e-book retailers above. 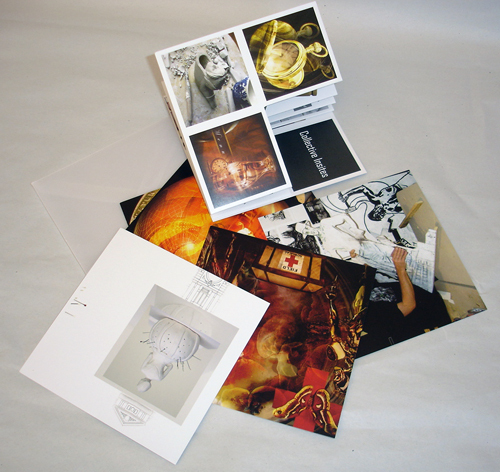 The funding available through the RADF grant was augmented by a generous donation from Downer EDI that allowed the production of a printed package that included a small fold out colour catalogue and an artist card for each of the artists. The whole was enclosed in a vellum envelope and was a much sought after memento of the exhibition. 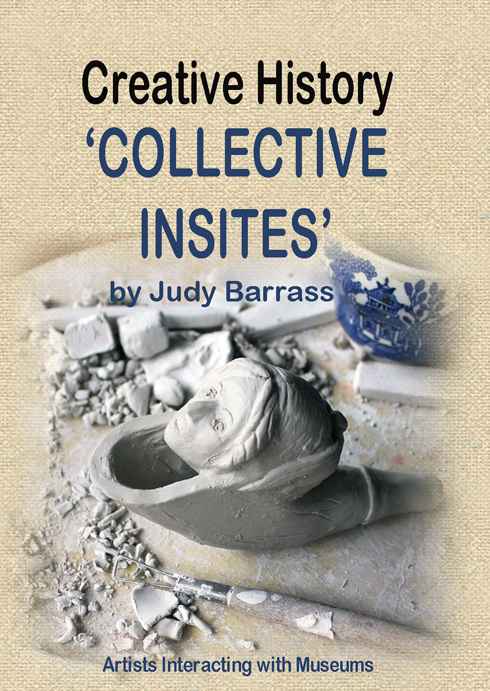 The full text of the catalogue essay by curator Judy Barrass is available in the pages on this site (above or right). What is the exhibition about? This exhibition is called ‘Collective Insights’ and it is about re-interpreting several of Maryborough’s museum collections. There are 5 artists involved and each of us have selected a particular museum collection. For instance I am using a Bond store collection which relates to Maryborough’s industrial history. These wooden patterns were removed when the bond Store basement flooded. 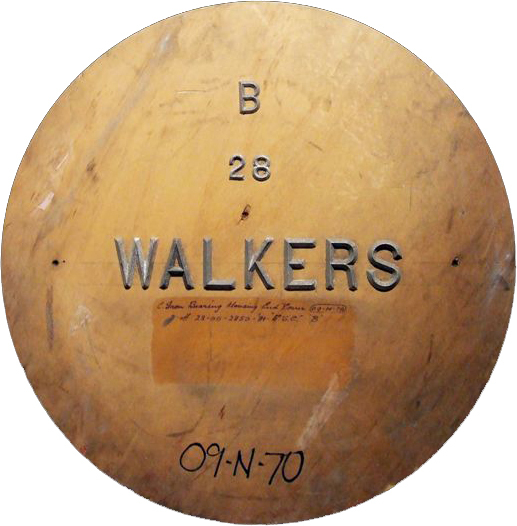 I am looking at aspects of the industrial history related to them, the kind of industry they represent and as artefacts, how they have a voice from the past. How are you going to use them? I see them as a part of a larger picture so to speak. As objects they now , especially in a gallery setting, relate to us as beautiful forms. We enjoy the timber quality, the design and appreciate the skill of the artisan/tradesman who made them. However they were only part of an extensive process . They were used to produce metal components of machinery systems for a variety of industries. Now I want to incorporate the idea that they have a link to the past so in my drawing I use them in the overall composition , to give a recognition and acknowledgement to the design. I also want to show the human element as they were not just stand alone objects. The human form is important and adds to the drama of the drawing. This drawing though is only a part of my overall installation. 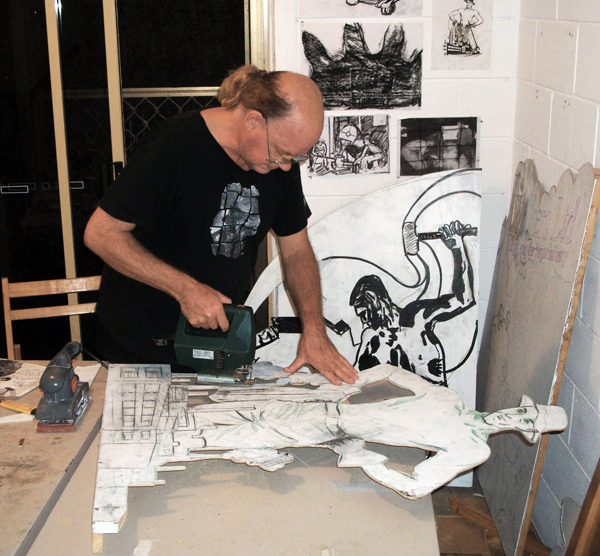 I usually interface other mediums such as sculptural forms, digital media with the large-scale drawings to create what I call multi dimensional collages or what has been termed Grand narratives. What do you want to achieve with this multi dimensional Collage Niels? 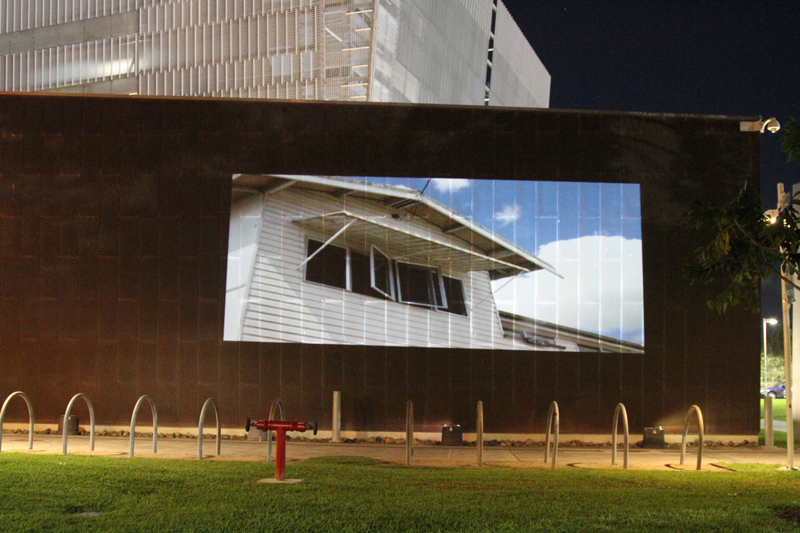 What I want to achieve is to hopefully involve or immerse the viewer with the different mediums so that they get an overall reading of the installation. I generally have a number of themes that are just below the surface. These relate to art history, community, history and cultural landscape. Walkers Engineering company and Croydon foundries which I am investigating have a grand local history which in these patterns whilst they are part of it , you can’t really know about it so it is up to the artist to bring other aspects to light. Museums today have the same problem as often and in this case there is scant evidence so often a museum has to make up a narrative about a particular exhibit and generally provide a story or diorama which somehow relates to the artefact they are presenting. I like the idea of a tension between education and entertainment. When you see the other parts of my concept hopefully you will see what I am getting at. So overall I want the viewer to be entertained, question and be educated in some way. There should be a few optical tricks and an extension from the basic artefacts which are the patterns. I am exploring hidden histories a theme which I began back in 2001. 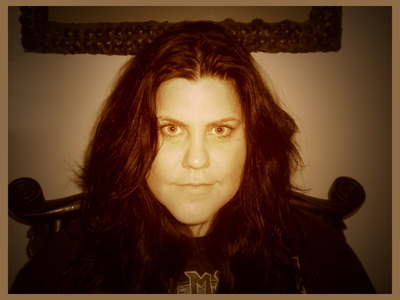 I feel that I can engage with a particular community that I am living in if I shed light on various local histories. I am influenced by a number of artists that have dealt in some way with these kinds of themes. The significance of material evidence is crucial where documentary evidence is inadequate and in technological history this is often the case. application. I also let my sub conscious mind work so that the drawing becomes infused with abstract shapes that become lines of energy which link focal points in the composition almost like a blueprint. For the sculptural or 3 dimensional parts of the installation I will use some of the patterns themselves to provide a museum context. Other materials such as transport palettes, wooden box , plywood cut outs, dioramas etc will be incorporated. The digital media will consist of a tv monitor showing a loop of documentary footage. 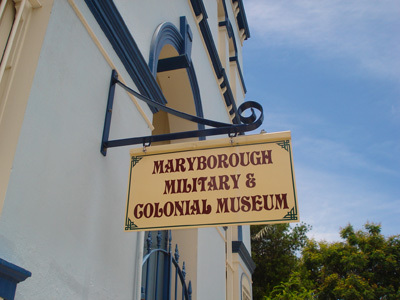 The Maryborough Military and Colonial Museum is a surprising gem to find in a regional centre. It was established as a private museum by John and Else Meyers using much of John’s own extensive collection. The museum is now a public trust, and the collection has been added to by generous donation and further collecting.This important collection interprets military campaigns and aspects of Australia’s colonial history. It is housed in a magnificent old warehouse style building near the wharf area in Maryborough, and contains many significant objects. 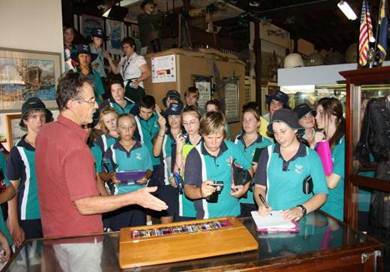 The museum is staffed by volunteers and is very much a part of the local community. As part of the Collective Insites project digital artist Peta Duggan will be interpreting the collection in her own inimitable style. Peta’s work will be part of the Collective Insites exhibition at Gatakers Artspace in May, and she will be having a solo exhibition at the gallery later in the year.